This cup and ring marked stone was recently found at Woodlands Farm near Evanton. It has at least 60 small depressions (cups) of varying sizes, three of which are circled by grooved rings. Cup and ring marked stones are commonly found throughout Scotland and northern England, and date to the Neolithic or Bronze Age. Many as in this example are on boulders, but in some cases they appear on vast outcrops of rocks. Some have cups able to hold small amounts of liquids or solids, but in other cases the cups are pecked into the rock at angles, and in some cases, as at the Clava Cairns near Inverness, the stones are even oriented upright, so that the cups are on end. The reasons behind the carvings remain a mystery but suggestions include route or territory markers, ritual markers or places for offerings, mapping of the stars or even possibly the doodles of bored shepherds. 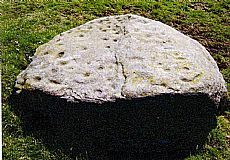 Easter Ross has a cluster of fine cup and ring marked stones, but other fine examples appear elsewhere in the Highlands, particularly at Kilmartin Glen. The Easter Ross examples are currently the focus of a study by John Wombell from North of Scotland Archaeology Society who has almost doubled the known corpus of stones in the last few years. This example was also previously unrecorded. So the next time you are out walking, especially when the light is bright and at an angle (for example in the winter), keep an eye out for similar stones! This find was researched by Carolyn Samsin as part of ARCH’s Community Timeline course in Evanton. The results of the project can be seen over the summer at the Cornerstone Café in Evanton, and binders with further information have been placed in the Café and in Dingwall Library.